Originally proposed as a flight simulator to be developed by volunteers as an alternative to simulators such as Microsoft Flight Simulator, the first version of FlightGear was released in 1997. A free simulator, several versions have been released since then, and it is continually updated, with new versions still being released. What makes FlightGear special however, other than being a free flight simulator with decent graphics, is the sheer amount of user-created aircraft there are. The game is kept active and updated by the community, with thousands of aircraft available to download. The actual gameplay is fairly realistic, and will be able to provide entertainment for enthusiasts and normal players alike. Farming Simulator isn’t the most in-depth simulator. In fact, it could be best described as a non-simulation game with simulator aspects. However, FS is still super fun , and can be made even more entertaining with multiplayer. The missions while not hugely varied are still pretty awesome and there is a certain satisfaction after completing them. If you are a fan of farming, there really isn’t much out there that is up to the quality of this series so Farming Sim definitely is the best choice. Chances are you haven’t heard of this one. YSFlight by no means has good graphics. The simulation and flight dynamics aren’t realistic. But, if you want a free flight simulator with an active community that is easy to mod, then this is for you. There is no better free simulator to mod for, and communities based all, with forums in every continent and major language, that host events such as airshows and maintain servers and even virtual airlines. If you want a free, fun, easy to use simulator that has an active fanbase and thousands of mods, then there really is no better choice than YS. Number 12 on unFOMO’s list goes to X-Plane 10. Although compared to rival FSX X-Plane does not feature such a wide array of aircraft, developer-made or third party (but there has been a lot more interest in X-Plane modding recently). In terms of graphics, X-Plane has fantastic lighting and the weather effects can be pretty great as well. Many consider it to have a more realistic flight model than that of its rivals. Whether or not it’s true, there’s something about X-Plane flying that gives it a unique responsiveness. Developed by Chris Sawyer and released in 1994, this classic game is not something you would normally expect to be given the title of simulator, but falling under the category of business simulation it most certainly is. Run your transport company, compete and make money. A fantastic game that spans an entire century, expect to be dragged in for hours, keeping up to date with the latest technology or making sure that the great train crash of 2025 never repeats itself. With a fan-made recreation that supports 1980×1080 screens and above, this is a classic that you need to play. If you’re a fan of flight simulators, you’ll notice that there’s one area that for one reason or another, is largely ignored – World War One. Rise of Flight is perhaps the best example of a WW1 flight combat simulator. The brilliant multiplayer, the fun-to-fly flight model and the satisfying combat and damage systems, it is a fantastic game. Although, if you are big on campaign, Wings over Flanders Fields may be an option to check out, but in terms of simulation Rise of Flight is better and that is why it’s on this list. Another business simulation game, RCT2 is a sequel to the classic RCT, also developed by Chris Sawyer. Although very similar to the original, many business models in RCT2 are better than in RCT and there is more content, especially with the two expansion packs. If you want to play the campaign, then RCT is the way to go, but for creativity and simulation, it’s RCT2. The 3D sequel to this game would also be a contender, but a lot of the management is toned down and although thousands of mods have been developed adding a lot of content, it’s very hard to make parks look nice and to unleash your creativity. OpenRCT2, similarly to OpenTTD, improves the game a lot in terms of graphics and resolution, and even adds a multiplayer mode. A classic that should not be missed. Very realistic flight models, great multiplayer, great sounds, Falcon is absolutely brilliant. Benchmark Simulations, an F4 development group, continually add improvements to the game that was originally released in 1998, however with BMS it could easily have been released this year. The already great game is made better with great graphics, a 3d cockpit, better flight modelling and physics, F-18s, F-15s and F-14s added (that’s not all – there are thousands of community mods that add aircraft such as the Tornado and Mirage). There’s not a great deal to say about the game here, other than it’s the definition of a simulation and you should really play it. This is not the most accurate military simulator but it has just enough mechanics such as running out of breath, cover, (partly) realistic gun play and the overall madness and fumble of a multiplayer battle. The game’s tank gameplay is also better than a lot of tank “simulators” is. To win, you will have to actually work as a team and the side you choose, the weapon you choose, where you attack the enemy from all have an impact on the battle. Points as well for the game’s great historical accuracy. Great and actually worth-the-money content packs and a fair price to begin with already put Assetto highly. It doesn’t provide any new gameplay to the genre, but it does nearly perfect it. The great visuals, realistic audio and brilliantly realistic handling make this the premier racing simulator and extremely fun to play with a gear shifter, steering wheel and pedals. A very fair payware model and a fun free game to begin with make DCS World worth the money to begin with. Intense realism and fantastic flight models as well as satisfying gameplay makes DCS World a great game for any aspiring combat pilot to play. Arma 3 is hands down the best in the Arma series. A very well-done multiplayer and Steam Workshop mean that you will always have something new to play with. Like Rising Storm, this also offers other vehicles, primarily aircraft and tanks. 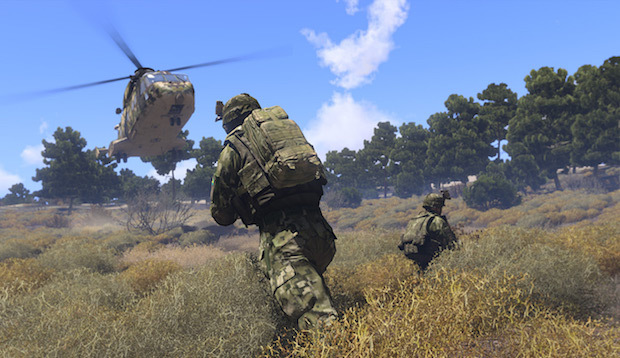 While these simulations are not as accurate as the ground combat is, they still provide good fun in multiplayer and can add a lot to missions. Overall a great game to play whether or not you want to have a serious simulation experience. While it’s not the most accurate simulation, it’s certainly the best trucking game (there are surprisingly many of them, and they’re… not so good for the most-part) and nearly the best driving game. The real fun comes from spending hours driving across Europe’s roads, taking in breath-taking scenery while hauling cargo and building up your trucking empire. A fantastic game and a great simulator. ETS2 remains one of my personal favourites. Watch out February 3rd, as American Truck Simulator is released, promising everything ETS2 did and more. No doubt many of you expected this to be first. While I could make a love letter to FSX, I’ll keep it somewhat shorter. FSX is not the best simulator vanilla. However, with the multitude of modders and other developers who are creating amazing content for FSX and some of the most realistic and detailed aircraft yet. There are mods that not only add aircraft but expand on the game, adding combat, airshows, campaigns, ground crew, and some that make FSX look like real life (if you squint your eyes a bit). FSX is truly a game that, entering its 10th year of service, has stood the test of time. I’m going to keep this one short as you need to play OMSI to truly appreciate its greatness. Based on a Berlin of the childhood of the two developers, OMSI’s world is beautifully crafted and there is a sound effect for everything, even sliding windows. The simulation is incredibly accurate; if you haven’t played OMSI, get it right now and thank us in the comments below!